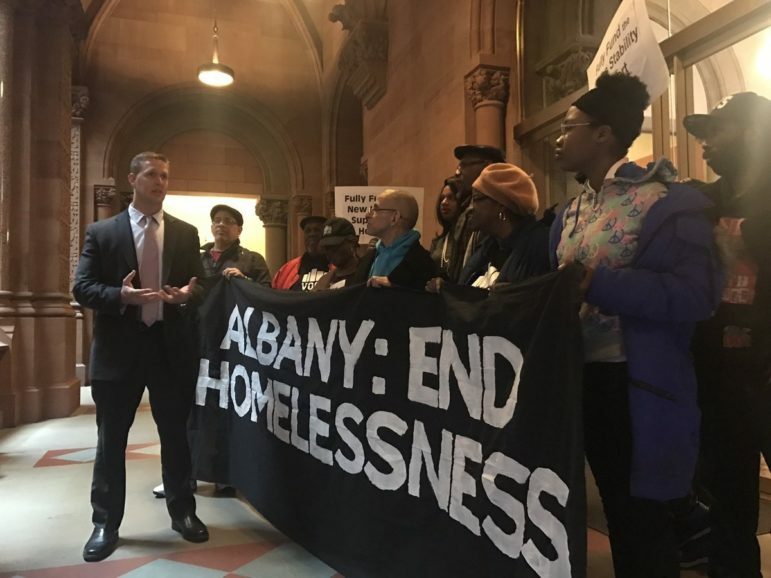 With Mayor de Blasio confronting the intractability of the city’s homelessness crisis and a new report documenting the risk of displacement faced by one million New Yorkers, advocates say the housing crisis needs more ambitious solutions from Albany. On Thursday, a coalition of community organizations along with state elected officials held a rally outside the senate chamber, demanding the passage of three tax-reform measures they say have the potential to create an additional $6 billion in revenue that could be used to address homelessness and other issues. The first proposal of the coalition’s “Albany Can End Homelessness in New York State” campaign would raise the income tax rate for the rich by extending and expanding the so-called “Millionaires Tax.” Under progressive reforms first enacted during the recession and set to expire at the end of this calendar year, single earners making more than $1 million pay an income tax rate of 8.82 percent a year, while those making below $1 million pay at graduated rates from 4 to 6.85 percent. Governor Cuomo, who at one point opposed the higher tax rates on the wealthy, has committed to renewing the graduated tax system. But Assembly Speaker Carl Heastie—with advocates’ backing—has proposed that earners (of any filing status) making between $1 and $5 million pay at a rate of 8.82 percent, that those making between $5 and $10 million pay at a rate of 9.32 percent, and those making above $10 million pay at a rate of 9.82 percent. The second reform would raise the low tax rate imposed on what’s known as “close carried interest,” a performance fee charged by hedge funds for managing other people’s money. Legislation backed by the Independent Democratic Conference (IDC) and supported by advocates would increase the tax on this income source from 20 percent to 39.6 percent, making it more in line with the tax rate on other management fees. To prevent competition from nearby states, the new tax would only take effect when New Jersey, Massachusetts and Connecticut also adopted the new tax rate. Similar legislation has been introduced in those states. Last but not least, advocates are calling for the Mansion Tax pushed by de Blasio, which would impose a 2.5 percent property-transfer tax on real-estate transactions above $2 million, in addition to the 1 percent tax already applied on sales of more than $1 million. De Blasio’s first attempt to get such a tax, in 2015, was met with resistance in Albany and failed. With strong Republican opposition to increased taxes on the wealthy, analysts say the passage of all three measures is a long shot. Advocates argue the state desperately needs the revenue and that it could be used to fulfill the governor’s promise of building 20,000 units of supportive housing, fund Assemblymember Andrew Hevesi’s proposed Homes Stability Support program (a new rent supplement program)*, provide housing assistance to individuals with HIV, increase funding for civil legal services and support programs that might be affected by federal budget cuts under the Trump administration. Jeremy Saunders of VOCAL-NY says his group and others are frustrated that Cuomo’s “soaring progressive rhetoric” has, in their view, not been matched by action to address the unprecedented homelessness crisis, with 88,000 people living in shelters in the state of New York and a 41 percent increase in homelessness during Cuomo’s first term. Cuomo did not respond to requests for comment. While advocates are glad the IDC is supporting the closure of the carried interest loophole, they are critical of the IDC for allowing the senate Republicans to maintain power in the Senate, which they say creates a block for progressive policies, such as the passage of more stringent rent regulations in 2015. “It’s no secret that [IDC leader] Jeff Klein and Andrew Cuomo have a good working relationship. We want to see Jeff Klein use that relationship in fighting for a good progressive budget,” Saunders says. The IDC’s legislative platform to combat homelessness includes supporting and improving Hevesi’s Homes Stability Support program, expanding housing anti-discrimination policies, giving preference in housing lotteries to homeless families, requiring a survey of homelessness across the state, and renewing the millionaire’s tax. “Senator Klein released an alarming report on the deplorable conditions in hotels, motels and clusters sites used to house homeless families and individuals. No human being should live in dangerous conditions, and we must work to get our homeless population into apartments. 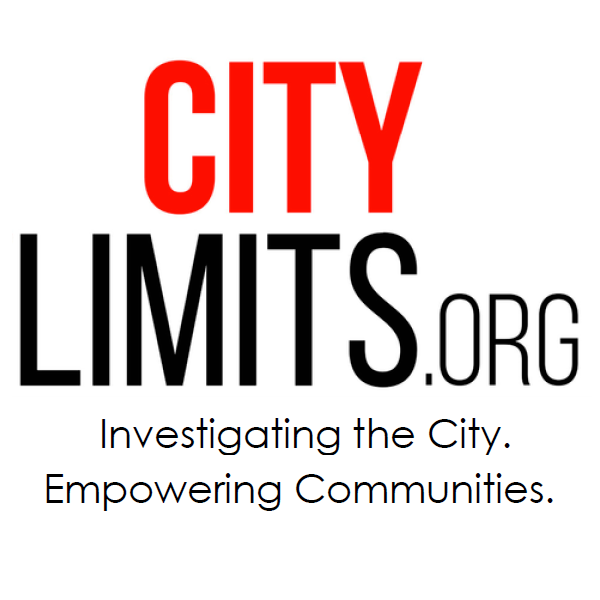 Senator Klein is advocating for the Home Stability Support program to ensure that families and individuals receive vouchers that can make the rent,” said Candice Giove, a representative for Klein, in an e-mail to City Limits. She did not say whether Klein supports Heastie’s proposed expansion of the millionaire’s tax or de Blasio’s Mansion tax. Over the past year, the IDC has grown from its earlier membership of five senators to eight, and from districts where cooperation with Republicans might be expected—in Staten Island, eastern Queens, and Westchester, for instance—to districts lying in the heart of the blue city, such as Upper Manhattan, Crown Heights and Jackson Heights. Advocates are waiting to see if the inclusion of representatives from those districts in the IDC will change the conference’s positioning. Marisal Alcántara, the new IDC senator from Upper Manhattan, was among the elected officials who joined Thursday’s rally, along with three other Democratic senators and four Democratic Assembly members, and spoke out in support of Hevesi’s Home Stability Support program. Asked for her stance on all three tax reform measures, she said in an e-mail to City Limits that she supported reform measures relating to the carried interest loophole and the millionaire’s tax, and her office clarified that she is “open to solutions that would retain or expand” the millionaire’s tax. She did not mention support for the mansion tax. *Correction: Originally stated that the proposed Home Stability Support program was Speaker Heastie’s idea. It’s actually Assemblymember Andrew Hevesi’s proposal. Is anyone addressing the impact of the terrible tactics of the Department of Social Services (DSS) on this issue? They are doing a good job of not helping eligible people. Dropping people for no reason. Forcing them to Fair Hearings to deal with workers who do not return calls and don’t mail out notices. In some cases mock disabilities… Who is holding them accountable? What better way to make NY even less competitive than by once again raising taxes on people with the means to flee the state. Mansion tax easy to avoid too. I think it is very promising that the tax on this income source would rise from 20% to 39.6%. Where do New Jersey, Massachusetts and Connecticut stand on adopting the new tax rates?